We have all been there, you walk into your Ford Transit ( or Ram Promaster, Mercedes Sprinter, Nissan NV200, Chevrolet Express etc..) work van and it is completely unorganized, worst of all the tool you need to get the job done is hiding underneath a mountain of materials, or other tools. As a small business owner your time matters, and the 3-5 minutes you spend searching for what you need is costing you. At Sterling we like to think that we don’t sell just Van shelves and Van accessories. We sell you time and efficiency back into your day. 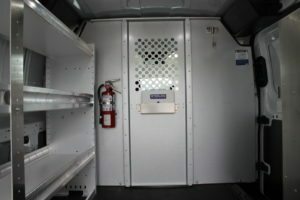 So here are 3 Tips to get the most out of your work van. Find a place for those ladders. If you transport ladders then you know what a pain it can be to tote those things around in the back of your van, nothing can come out of there until you remove the ladder in the morning, even if you don’t need it for the day. Not to worry! to optimize your vans interior dimensions you have a few options. Get that ladder out of your van entirely with a roof ladder rack. 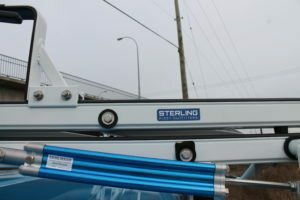 Slide your ladder up on top of your van and then easily secure it by using the clamping system. You no longer have to worry about strapping down your ladder by using clunky tie-downs and rope. You can cruise down the road to the next jobsite with your mind at ease knowing your ladder is securely attached to the roof. That’s easy right! Just grab your “Ladder Rack Tool” insert it into the device on the ladder rack and the hydraulic system drops down your ladders ready to work, at the end of the day you just simply place your ladder back on the rack and use the ladder rack tool to place your equipment back on the roof of your Work Van. 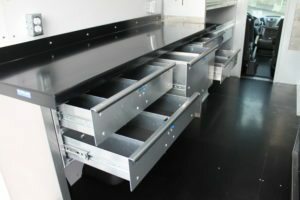 By equipping your van with shelves and drawers you quickly turn your vehicle into a mobile workshop. Don’t stop to look for tools during the day, just climb inside your professional work vehicle and grab what you need. There are two typical kinds of shelving, Steel and Aluminum. Economically, steel is a great choice, Steel Van Shelving and Steel Drawers are robust and durable. 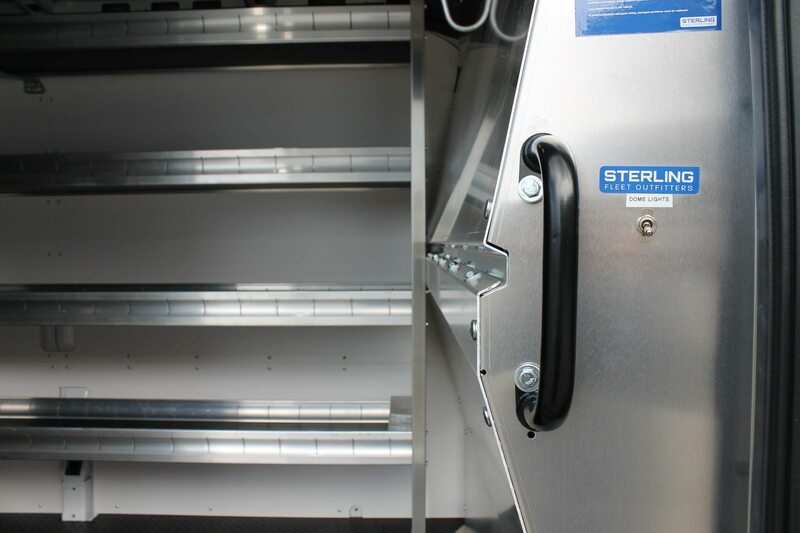 At Sterling we are proud to offer some of the highest quality steel van shelving on the market, Our Steel Shelving rattles less and lasts longer than the competitors. Aluminum shelving is the ultimate option for the mobile working professional, High quality construction and installation ensures a silent, rattle free ride. Plus with a 10-year warranty you can rest assured that your investment is protected. Having a partition is mandated by the CMVSS. choosing the correct partition for your needs is absolutely key. If you don’t need access or a way to view the back then a solid Partition will work perfectly for you, Solid partitions come either straight or contoured. The contoured option is preferred due to the extra leg room it gives the driver and passenger as well as the minimal footprint in the cargo area, allowing you to maximize the inside dimensions of your van. To increase visibility into the cargo area of your van there are a number of safety partitions available with windows. You can choose from: tempered glass, an aluminum grate, or wire mesh. If you need to have access to the cargo area from the front seats of the vehicle then the most logical solution is a walk through partition. You can either choose to have an opening between the front of the vehicle and the cargo area or have a door installed with the partition, giving you quick and easy access to the rear cargo area. On top of the safety justifications for a partition it also ads a second layer of security to your vehicle. If someone happens to break into the cab of your vehicle they will be unable to get into the cargo area where you store your tools and materials. Purchasing your van is the first step on your journey to the ultimate mobile workspace. Don’t waste your valuable time dealing with a van that isn’t set up properly for you. Give us a shout at 604-576-2300, we would love to help you design your van setup! That is a great point when using roof ladder racks. It would be great to be able to just slide a ladder on top of a rack and secure it with a clamping system. I might have to get one for my truck since I don’t have a van.